When you think of Easter, do you think of a giant omelet made with 4,500 eggs? Or sprinkling perfume on someone’s head in exchange for a kiss? Did you know the very first Passover was celebrated in Egypt more than 3,300 years ago or that the world’s largest Passover seder is held yearly in Nepal? Just like diverse cultures themselves, for all we think we know about these two holidays, there is always more to learn. “Sprinkling” is a popular Easter tradition in Hungary, in which boys playfully sprinkle perfume, cologne or water over a young woman’s head and ask for a kiss. People used to believe that water had a cleaning, healing and fertility-inducing effect. In the French town of Haux, a giant omelet made with 4,500 eggs that feeds 1,000 people is served up in the town’s main square for Easter. In Sweden, children dress up as Easter witches and travel from home to home trading paintings and drawings for sweets. In Corfu, Greece, Easter comes with a noisy clatter. The tradition of “Pot Throwing” takes place on the morning of Holy Saturday when people throw pots, pans and other earthenware out of windows, smashing them on the street below. Passover is the oldest Jewish holiday. The very first Passover was celebrated in Egypt more than 3,300 years ago and marked the first holiday ever celebrated by the Jews. The world largest matzah ball, a traditional Passover creation, was made in New York City in 2009.It measured 22.9” wide and weighed 267 lbs! 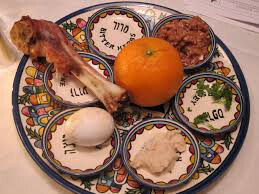 The traditional seder plate is a circular plate with six spots on it, each to hold a different symbolic food to be eaten during the Passover meal. In recent years, a new tradition has begun to form – a seder plate with seven spots instead of six. The new seventh food? An orange. The orange is said to signify fruitfulness, and the action of spitting out the seeds represents “spitting out” hate and discrimination in our communities. The world’s largest Passover seder, boasting more than 1,000 participants, is held yearly in Kathmandu, Nepal. The country is overflowing with young Israeli travelers who have recently finished their army service. When it comes time for Passover, some want to be reminded of their mom’s chicken soup or experience the familiar crunch of matzah. Other attendees simply hear of this massive event and feel compelled to travel to Nepal to experience the holiday in such a unique way. If you have any interesting traditions of your own, share them with us! We’re always eager to learn more about unique cultures and customs of the world. That’s what helps to make us experts in translation and interpreting services. This entry was posted in International Traditions, Language facts. Bookmark the permalink.